Welcome to our dedicated section featuring the best and easiest Super Bowl Party ideas! More than 5 pages of ideas just for this occasion! Who doesn't love Super Bowl Sunday? Football fan or not, it's hard to resist all the hoopla and everyone wants to be at a Super Bowl party so what could be more fun than hosting a celebration on the day of the big game? Great ideas for football themed party foods, super bowl quizzes and trivia games and easy decoration ideas to turn your home into a football fiesta! Here's your home for awesome Super Bowl party ideas. Check out our suggestions for an easy Hot Dog Bar - a perfectly themed menu idea! We have some quick and easy Super Bowl party ideas for appetizer and dessert recipes, a fun, free printable NFL football quiz that makes for halftime entertainment while you are watching those great commercials. We also have a creative assortment of Super Bowl party games including a fun printable Penny Pool for the kids. There are creative Super Bowl decoration ideas here too. Plus check out our Quick and easy no bake desserts. You can color them in the competing team colors! Start your planning now and create a great party that even the kids can join in on! Want to get started early? Use these ideas for the playoff games that are starting this weekend. Spread the Super Bowl mania to your student's college campus.. send a Super Bowl Party in a Box.. the ultimate college care package idea... see how to send everything they need to have a Super Bowl party right in the dorm or campus apartment! It is the best idea ever and it will guarantee a thank you call as well as some texts during the game! 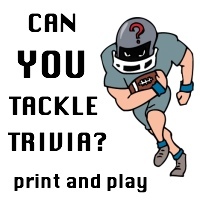 Combine it with some of the ideas here, like the Super Bowl Trivia game (a free printable) which you can print and add to your care package! It will be a wild hit and establish your reputation as the best parents on campus! With Mardi Gras just around the corner, why not add a Mardi Gras spin to your celebration. Here are some great ideas we suggest for hosting a Mardi Gras party that you can incorporate into your party.. it will have the guests feeling like they are watching from Bourbon Street. Our favorite tip.. adorn your guests with Mardi Gras beads in the competing team colors! 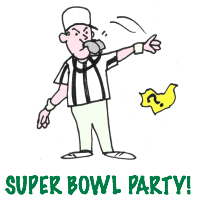 Here's a really fun assortment of more Super Bowl printable games that will keep your party going.. some really creative ones in here!